This frigate represents the last unit of the Anzac class frigate of the Royal Australian Navy (RAN) and is referred as the HMAS Perth (FFH-157). As the last of the class to be completed, she was commissioned into the RAN in 2006. 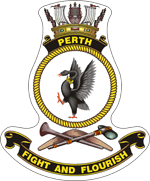 Interestingly, the Perth has been the first major warship of the RAN to be commanded by a woman. in the last years, the ship was checked as the test bed for a major upgrade to the Anzac class’ ability to defend themselves from anti-ship missiles. In mid-2007, Commander Michele Miller became the first woman to command a major RAN warship when she assumed command of Perth. On 18 January 2010, Perth docked at the Australian Marine Complex in Henderson, Western Australia to be modified under the Anti-Ship Missile Defence Project. Perth visited Wellington, New Zealand, in April 2012, leaving harbour on Thursday 26 April. In October 2013, Perth participated in the International Fleet Review 2013 in Sydney.